The hip hop culture has been around for decades. Some even say it’s getting stale and might be ready to die. But here in the North Shore ‘burbs, it’s just starting to penetrate our mostly white, aging, upper income existence. 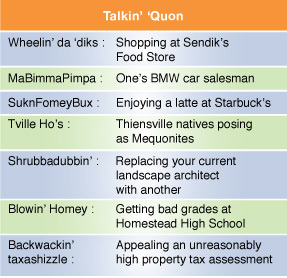 Here are some hot phrases the TMN staff has heard in the ‘Quon lately – and how they translate.